Following the spectacular sight of 600 paddlers – the most ever seen in a SUP race – standing on the start line in the heart of Paris at dawn, Bruno quickly broke away from the other contenders and never looked back, slowly but surely increasing his lead the entire way before crossing the line almost a minute clear. The main chase pack of about a dozen guys stuck together until the final kilometre, when the train splintered as the jockeying for the runner-up finish intensified. Top international athlete and newly-minted Red Bull team rider Arthur Arutkin (Fanatic) edged out rising star Martin Vitry (BIC) in a photo finish, with the unheralded Frenchman Tom Auber (Fanatic) claiming 4th ahead of Italy’s Paolo Marconi (RRD). With the defending champ Titouan Puyo busy chasing bumps in Western Australia, last year’s runner-up Casper Steinfath took the best odds heading into the race. However nobody could match Bruno, and in the end the Naish superstar couldn’t break free of the pack, crossing the line in 8th place behind the French duo of Ludovic Teulade (BIC) and Gaetan Sene (Starboard). 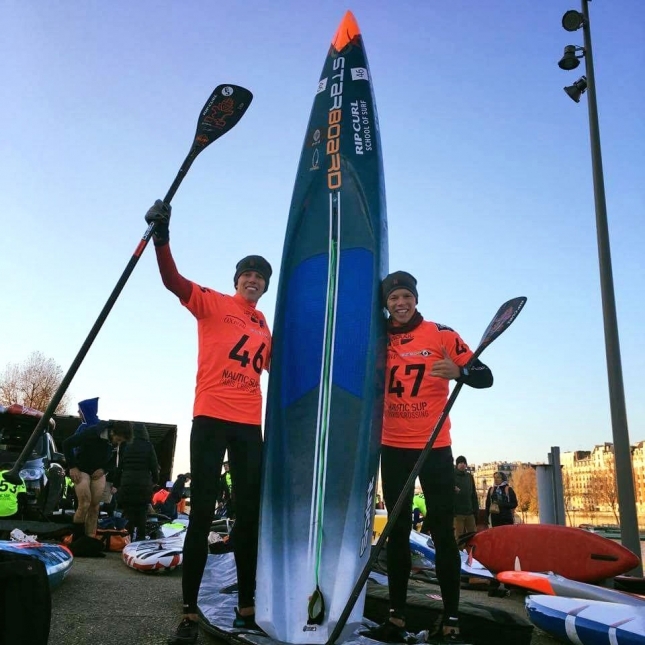 Italy’s Federico Esposito (Fanatic) and Lost Mills ‘Fastest Paddler On Earth’ runner-up Boris Jinvresse (Starboard) rounded out the top 10 in the pro division, which featured roughly 90 paddlers in addition to more than 500 in the amateur race. In the women’s pro class, Susak Molinero took the win for RRD after a sprint to the line with Frenchwoman Amandine Chazot (Starboard). The victory caps off a solid season of racing for the Spaniard, with Susak rising +10 spots to #16 on the World Rankings as a result. But while the pace was being set by the pro paddlers, what makes this race so special is the hundreds and hundreds (and hundreds) of weekend warriors filling the River Seine and creating some memorable imagery. After increasing entry spots by 100 from last year, the 2016 Paris Crossing has easily become the single largest SUP race in the world at 600 competitors. As always, the start line created some amazing video, with Latvia’s Arvis Iljins (Team Prestol) taking the virtual ‘golden buoy’ money shot after leading the massive field to the first bridge. Despite the freezing temps (most paddlers wore full suits with beanies and gloves) it was a beautiful sunny Sunday in Paris, with blue skies and the stunning backdrop making this an incredible adventure for everyone on the water. The Paris Crossing is the only time you can legally paddle on the busy River Seine through the heart of the French capital, which makes this race a truly unique experience. The course winds through the city for more than 10kms, passing iconic landmarks including the Notre-Dame Cathedral and the Eiffel Tower. While everyone starts at the same time and finishes in the same place, the pro riders do a loop around Île Saint-Louis, which adds a few kilometres to their version of the course. The race is part of the Salon Nautique Paris (Paris Boat Show), and after the race on the River Seine, competitors head back to the expo hall for some mad crazy exhibition sprint racing in the indoor pool (click here to see what that looks like). Interest in this race has surged over the years, with a lottery system being introduced in 2016 after the last two editions sold out in less than half an hour. I’m not sure of the final number, but I believe there were over 1,000 registrations for the 600 entry spots (if you want to be part of the experience in December 2017, look out for the lottery to open around August). Thanks to race director Didier Lafitte and the organising team from the Paris Boat Show for pulling off another great race. The Paris Crossing is definitely one to add to your bucket list. Finally, Mat from TotalSUP did a great job live streaming the entire race over on Facebook. Head over to the TotalSUP page to catch a full replay.